Mangaluru, Jan 23, 2018: “Alcoholics Anonymous” is a well known self help group equal to all of society without affiliations. in mangaluru city too it is active for several decades, and has been an anchor for thousands of alcoholics. Now, here in the city it is organizing its second International Convention in Mangluru, on January 25, 26 & 27, 2018 (Thursday, Friday, Saturday). It also celebrates its 60 th Anniversary of the Formation of A A in India and Mangaluru. The aim of A A International Convention is to create awareness among the general public about the dreadful disease called Alcoholism and to find the way to regain hope to lead a good life. The Convention opens on January 25, Thursday, at 5.30 pm at St.Agnes special School grounds Bendur Mangaluru. Rev Dr. Aloysius D’Souza, Bishop of Mangalore will be the chief Guest. Guests of Honour are Mangaluru MLA J R Lobo, Dr.M R Ravi, CEO ZP, Rev. 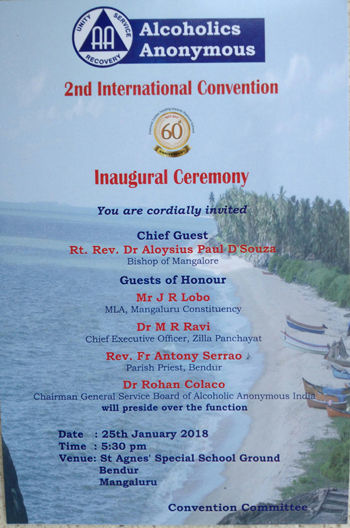 Antony Serrao Parish Priest Bendur, Dr. Rohan Coloco, chairman general, Service boardof Alcoholics anonymous will preside. many categories among alcohol consumers. The first are social drinkers who drink on rare occasions . but stop with the first drink. The second group called drunkards they drink heavily once in a while on a particular day but are not compelled nor have the urge to have a drink the next day. The third category called addicts who drink almost every day but not before completing their daily responsibilities . They drink only before having their dinner. The last category are alcoholics who drink at any time of the day for any reason and consume any brand available to them. ‘Alcoholism’ is declared as a illness by Word Health Organization (WHO) in the year 1956. The syndrome called alcoholism can only be described but cannot be defined. This is a syndrome of mental obsession to drink , and later the physical allergy takes over activating the urge to drink more alcohol. The rationality of an alcoholic stops working after his first drink. The third part of the illness is a hidden malady called spiritual bankruptcy. This is a progressive disease and ends up in either epilepsy, hallucination or premature death. An alcoholic shuns reality and seeks refuge in alcohol. An alcoholic cannot imagine life either with or without alcohol. Drinking is only the outer manifestation of an inner problem of deep seated emotional disorder. Alcoholism cannot be cured but can be arrested, it can be controlled only through abstinence by accepting the A A program, thus leading to a life of sobriety. In A A the members who have recovered from this malady of alcoholism, guide the new comers, to keep away from the first drink and help them to tackle their problems and lead a life free from alcohol. Alcoholism is an age old problem. Many countries, organizations, institutions and social workers have failed to find a solution for Alcoholism. A A has a program to help suffering alcoholics to find a remedy for their problem only if they have The Desire To Stop Drinking. It then becomes the business of A A to help alcoholics to avoid relapses and attain sobriety through the simple spiritual program which is derived from all religions along with a little help from medicine and some principles of psychology . The program enables to keep away from the first drink one day at a time. In 1957 a Mangaluru Harry.M. got the A A message through a recovering alcoholic from Canada. Out of the first five recoveries in India, four were from Dakshina Kannada District. A A groups started in Mumbai and later Vittal Pai took the lead to form General Service Office (India) of A A in Mumbai and served as its chairman for seven years (May 5, 1957 is considered as the day of the first A A Meeting). The A A Message reached Mangalore in 1958 through late Jimmy . M. and Charles D’sa. At present many A A groups are functioning every day in Mangalore, Bangalore, Malenad, Davangere, Mysore, Udupi, Utthara Kannada and many other places all over India and the number of members runs in thousands. Identities are are not used or disclosed in this set up. In spite of the great increase in the size and the span of the fellowship, at its core it remains simple and personal. Each day somewhere in the world , recovery begins when one alcoholic talks with another alcoholic, sharing experience, strength and hope.